Oh dear, since we've been back, it just seem as if no work was done while I was away, and I have a pile of work on the table to attend to. So just a quick blog post. It was our first day in Brisbane, which is about 45 minutes drive from Gold Coast. 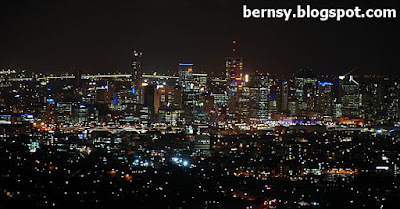 That night we came all the way up to Mount Coo-tha, a lookout location for Brisbane. The view is definitely breathtaking to say the least. The temperature was alright, but the wind was just unbearable, definitely made the coffee taste a lot better than it should. Brisbane had pretty good weather, say about 24C during the day and by night it goes to around 18C ( so nice !!). But up on the hill the wind was quite strong and wasn't dressed up to tahan the wind... so cold !! The cake was okay. 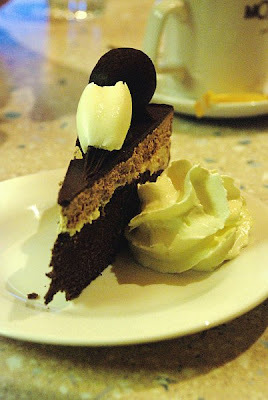 We ordered it because its called Ebony & Ibory.. hmmm.. its described as a cake that has white and black chocolate. Sounded very muhibbah, thats why I chosed that cake. No complains really, and shared this with Sayang. Now we ordered the two types of coffee. This is our first cup of real proper coffee we had. 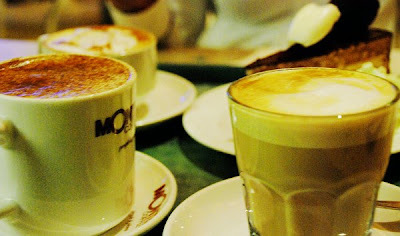 Capuccino on the left, and Latte on the right. They both tasted just rather normal and not really worth writing more about it. Next to this Cafe, you can find a Summit Restaurant , which probably serves real food. Kuta Cafe is open from 7am - 11pm daily and closes at Midnight on Weekends. You might not come up here for the food, but the view is definitely breathtaking, and if the weather is cold, you will definitely appreciate a cup of Hot Coffee or Chocolate. went on a hol? cool stuff! You and I both got WB problems , right ? the D80 when set on Auto WB, will reproduce very very good colors..... sigh !! !